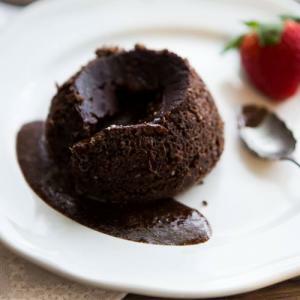 With their molten, oozing centers, these puddings are guaranteed to impress. Butter 6 small metal molds, the type used for sticky toffee puddings. (You can line the bottoms with a circle of parchment to prevent sticking). In a warmed small cup, dissolve the coffee granules in 1 tbsp boiling water. Leave to cool. Break up the chocolate by bashing the foil packet with a rolling pin and melt with the butter. Meanwhile, beat the eggs and sugar together until the mixture is thick and foamy and has tripled in volume. You will need to use electric beaters or the cake-making and whisk attachment of a food processor for high on 10 minutes. Pour the dissolved coffee and the melted chocolate on to the egg and sugar mixture and briefly beat to combine. Tip in the flour and beat again, just long enough to combine. Put the buttered molds on to a heavy baking sheet and pour in the batter, leaving a good 1cm/1/2 in space at the top for the sponges to rise. Put the baking sheet on the middle shelf of the oven preheated to 200C/Gas 6/fan 180C and cook for 8-9 minutes, until they look set and firm enough to turn out. Remove the puddings and leave them to cool for 5 minutes before carefully turning them out - the top is the most vulnerable. Serve with double cream.